Cauliflower should be available from mid to late April. You can use dried or tinned chickpeas. Add extra time when using dried chickpeas. Soak 200g dried chickpeas overnight and boil the next day for around 1.5 hours. Boil the cauliflower for around 3 minutes. Heat the oil in a pan and add the turmeric, fry for 30 seconds. Add the raisins, cauliflower and chilli flakes and stir-fry for 4 more minutes. Add the drained chickpeas and heat through. 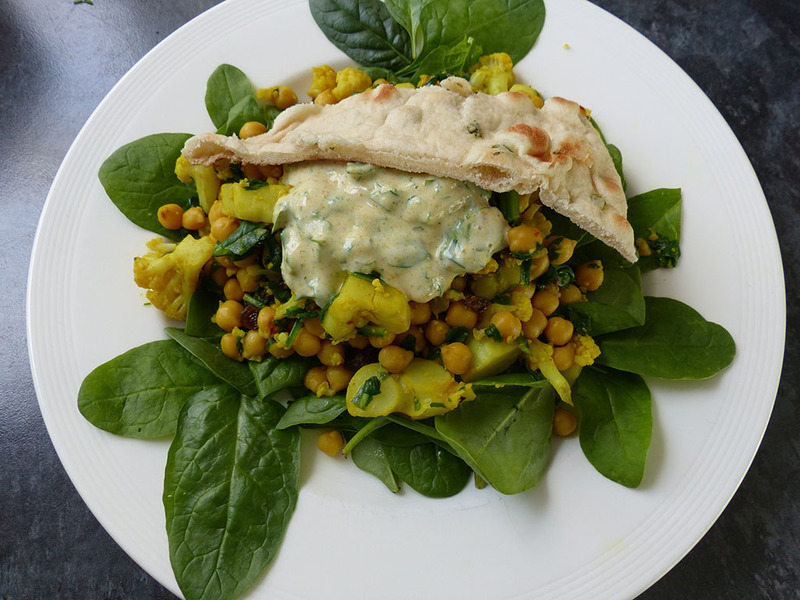 Make a dressing with the yogurt, curry powder, water and coriander. Put the spinach on a plate, pile the chickpea/cauliflower mix on top of the spinach and add the dressing.